It’s been a slow, cool start to the year for much of New Zealand’s property market but new data suggests the Wellington market is bucking the trend. The latest Trade Me Property Price Index shows that the national average asking price falling 1.7% to $629,800 in January, as compared to December. However, the national average asking price was up by 3.7% year-on-year and, if Auckland was excluded, it was up by 5.3% year-on-year. Auckland’s average asking price fell harder than the national average in January. It was down by 3.3% to $911,250, which was a $30,000 drop from December’s record high. While Auckland’s January asking price was up from the same time last year – it was only slightly, by 1.8%. Head of Trade Me Property Nigel Jeffries says Auckland is experiencing a more significant slowdown than the rest of the country. “Kiwis trying to get a foot on the Auckland property ladder will be breathing a small sigh of relief that the rate of growth has eased as the Reserve Bank’s LVR restrictions slow the market right down. But he says Auckland property owners don’t need to panic. In contrast, the Wellington market continues to power on, according to Trade Me Property’s January data. Jeffries says that for the fourth consecutive month the Capital’s average asking price reached a record high as growing interest put pressure on prices. The average asking price was up 10.8% on last January to another record at $570,200, while the average number of views was up by a solid 21.4% year-on-year, he says. Around the rest of New Zealand, January’s market results were solid in most areas. Six regions hit record average asking prices in January although the average asking price in both the West Coast and Gisborne dipped. Otago saw the biggest year-on-year increase in January: its average asking price rose 11.5% to reach a new high of $535,350. 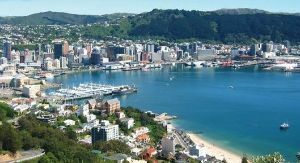 Jefferies says there have been massive changes in the Otago property market over the last five years, with property prices soaring nearly 59% since January 2013. Hawke’s Bay (up 11.4% to a record $512,500), Northland (up 6.3% to $550,750), Bay of Plenty (up 6.1% to $610,200), and Nelson (up 5.2% to $583,350) are all doing well. Jeffries says there is still fierce demand for property in the North Island, with property in Gisborne, Northland and Wanganui all seeing significant increases in views (51%, 39% and 36% respectively).